Carlin and the crew of the Vestas Wind, sponsored by the Danish wind turbine manufacturer, fell back on their training and instincts to ensure everyone got out safely and there was as little impact on the environment as possible. 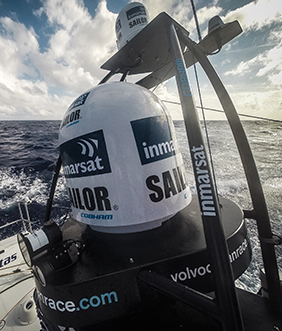 Modern technology played a part as well, with the boat constantly in contact with race control through Volvo Ocean Race partner Cobham's IP, satellite and VHF communication systems. 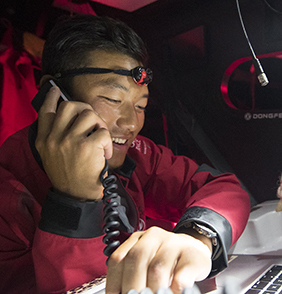 This is Carlin's first Volvo Ocean Race as onboard reporter (OBR) and, like his counterparts on the six other boats taking part in the challenge, his main brief is to record life onboard. The OBR is not involved in the racing side of crewing the vessel but does prepare meals in addition to reporting duties. The 31-year old Carlin says he has had a passion for sailing since the age of eight, getting involved in the racing scene in his native Republic of Ireland. His parallel interest in photography became part of this and took a different direction when he was asked to conduct interviews with race competitors for a YouTube channel. Up until 2012 Carlin had spent six years working as an architect, balancing the sailing and photography with his day job. Then he made the big decision to make what had been a hobby, his career. "I'd got a job as official photographer when the America's Cup World Series was in Ireland," Carlin explains, "and that made me think about quitting architecture. In 2012 I became an onboard cameraman for the World Match Racing Tour, although I didn't know much about cameras at that point." After this Carlin set his sights on the Volvo Ocean Race - along with around two and a half thousand other people. Just when he thought he hadn't made it through, Carlin got a last minute invitation for an interview to take part. Passing that, he went through OBR training in London and at the Race's headquarters in Alicante under Volvo Ocean Race senior producer Rick Deppe. "We also went to see Inmarsat, Cobham and LiveWire to get familiar with the equipment," Carlin says. 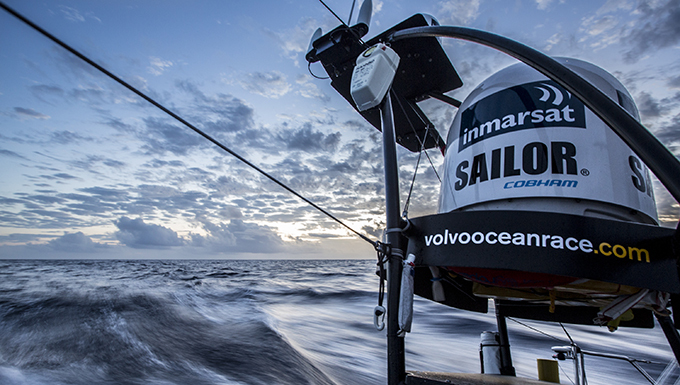 Cobham is a technology partner to the Volvo Ocean Race, supplying IP connectivity through the NETNode Mesh radio system the Cobham Surveillance business, plus VHF radio systems and satellite antenna from Cobham SATCOM. While the OBRs are instructed in how to use the communications equipment, Carlin says camera technique is left largely up to the individual reporter. "If I'd wanted help with that I could have had it, but I'd developed my own style over about a three-year period and also wanted to use my own gear," he says. This includes a Canon 5D MkIII digital SLR with four different lenses and a GoPro camera. The OBRs also have the option of shots from five cameras built into the boat and audio through microphones positioned round the vessel. All this technology came into play on the evening of 29 November 2014, when Vestas Wind was passing through the Indian Ocean. "It was 6.30 local time and there was a squall coming in on the port side (left-hand) of the boat," Carlin recalls. "The sun was going down and I went below deck to finish cooking the meal, which was something horrible and freeze dried. Not long after that we were getting thrown about and I went about four metres, banging my head on the forward bulkhead." The yacht had struck the Cargados Carajos Shoals, an isolated reef 240 nautical miles northeast of Mauritius. Looking up through the hatch and seeing the boat was grounded, Carlin hit the crash button. This activated the emergency audio-visual recording system that is fitted to all the Volvo Ocean Race boats to capture the four minutes before an incident and then the subsequent four minutes. A crewmate radioed a distress message, but because the telemetry of each boat is monitored, the Volvo Ocean Race control centre knew the second the accident happened. Further reassurance came when, Carlin says, the masthead of competing vessel Team Alvimedica, was spotted. Its crew was contacted by VHF radio and they remained on standby in case immediate help was needed. While his crewmates dealt with the damage to the hull, Carlin got on with the job he says he was trained to do. "I ran back to the media desk to get footage off the system," he recalls. "I couldn't find some of the cables I needed but managed to copy files to hard drive. I then had to decide what to shoot on - my Canon or the GoPro - and what other equipment to save." Opting for the GoPro, he put the Canon and gear he didn't need immediately into peli cases or waterproof bags. By 3.30 in the morning and with waves pounding the Vestas Wind, skipper Chris Nicholson decided to abandon ship and get the crew into a life raft. As sharks were in the water they couldn't get very far and so stayed tied to the boat until morning. "We kept in touch using the VHF radio and the Cobham antenna systems, both of which were working," Carlin says. The daylight brought with it a coastguard boat, which rescued the team and took them to the isolated islet of Ile Du Sud. There they remained for two days until a fishing boat, the Eliza, came past on one of its infrequent visits and ferried the yachtsmen to Mauritius. While on the island, Nicholson organised salvage trips to Vestas Wind to remove, supplies, hardware - including Carlin's video gear and the comms equipment - plus anything that could potentially harm the eco-system of the reef. Eventually, all traces of the boat were removed from the area. Carlin later worked with the Volvo Ocean Race video production team to edit his footage into packages for broadcast and posting online. This material also formed the basis of an eloquent presentation he gave at a gala dinner for all the competing crews in Abu Dhabi. Vestas Wind is being rebuilt and the team hopes to rejoin the race when it reaches Lisbon in June. Carlin, clearly undaunted by events in the Indian Ocean, will be with them again: "I'm itching to get some sailing done. I'm not sure this kind of comeback has been done before, so it's a fantastic story and one I want to tell. It'll be one of those stories I can look back on in 20 years, which is pretty cool."